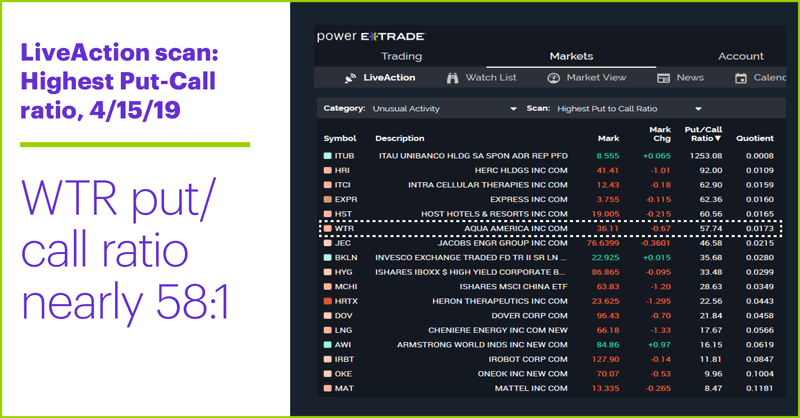 An up-trending stock suffers a sharp intraday loss in early trading, but rallies to recoup most of it and close toward the top of the day’s range. 1. Traders expressing a bearish outlook by purchasing options—i.e., puts—that can allow them to profit if the stock declines. 2. An extreme level of bearishness that may be a (contrarian) bullish signal if it accompanies a sharp sell-off after an extended downtrend. 3. Or, it can mean neither, if existing open put positions were being closed out. In this case, the vast majority of the WTR put options volume (2,400 contracts) occurred in the April $35 puts expiring on Thursday. But the open interest—that is, the number of existing open trades—for these options was less than one-tenth of the volume, which means most of the day’s put volume consisted of a trader (or traders) getting out of the April $35 options, not getting into them. So, it appears we may have a case of traders and investors discounting a stock because there will suddenly be more shares of it out there in the marketplace—aka “dilution.” But whatever potential downside they saw in the news seemed to evaporate pretty quickly: By 2:45 p.m. ET, WTR had trimmed the day’s loss to less than -1%. 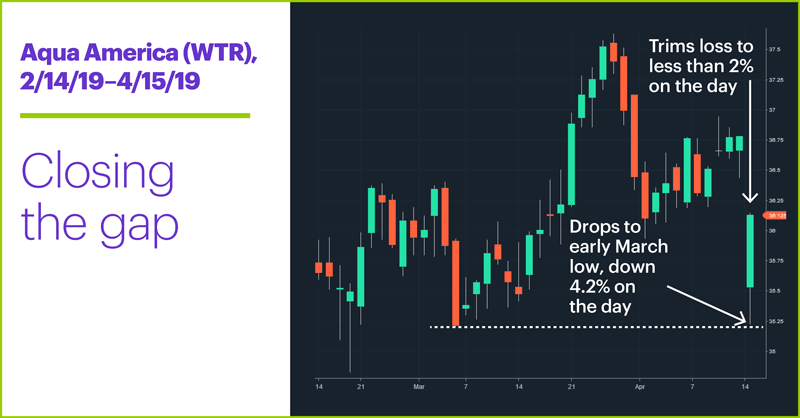 So, although the specific short-term catalysts underlying the WM and WTR moves may be different, the implications of both events could turn out to be very similar. Market Mover Update: Speaking of Waste Management (WM), the stock rallied nearly 4% intraday yesterday to a new record high of $105.68 before trimming its gain to around 2.5% late in the session. For the second time in the past two weeks, June gold (GCM9) retreated to support around $1,285/ounce. Today’s numbers (all times ET): Industrial Production (9:15 a.m.), Housing Market Index (10 a.m.); China GDP, Industrial Production, and Retail Sales (10 p.m.). Today’s earnings include: Bank of America (BAC), Comerica (CMA), First Horizon (FHN), Johnson & Johnson (JNJ), Omnicom (OMC), PacWest Bancorp (PACW), Pentair (PNR), Progressive (PGR), Prologis (PLD), UnitedHealth (UNH), CSX (CSX), IBM (IBM), Netflix (NFLX), United Continental (UAL). 1 StreetInsider.com. Aqua America (WTR) Commences Common Stock and Tangible Equity Unit Offerings. 4/15/19. 2 Barron’s. Aqua America CEO Sees Surge in Water-Related Deals. 2/27/19. Stocks continued to edge toward records as initial Q1 earnings topped estimates. Waste management stock gets taken to curb, bounces back. Yelp makes a noise: Options volatility implies possibility of big move.